AMD's Phenom II X6 1055T is one of the best value for money propositions on the market. It's a true six-core CPU that can be found for around $230 from online stores and we heartily recommend it if you want to build yourself a fast PC without spending an exorbitant amount of money. AMD is making noise in the CPU market once again. The once-forgotten company's new Phenom II X6 1055T (HDT55TFBGRBOX) is the first consumer chip to feature six physical cores and it's perfect for heavy multitasking and running multithreaded applications. It's also tremendous value — the Phenom II X6 1055T is a sub-$300 CPU that offers performance similar to an $800 Intel Core i7 8xx-series CPU. Because it's such a good bang-for-buck proposition, it makes sense to consider the AMD Phenom II X6 1055T if you're about to build or buy a new high-end PC. Its recommended retail price is $269, but it can be found for as little $229 if you shop around. That's under $40 per core and the money you save on the CPU will allow you to invest more in other system components. The Phenom II X6 1055T fits into an AM3 CPU socket and has been built using 45 nanometre transistors. The CPU has a thermal dissipation rating of 125 Watts (the amount of heat an attached CPU needs to be able to dissipate), which is excellent when you consider that it's the same as the quad-core Phenom II X4 940 Black Edition CPU, which we reviewed back in January 2009. It has six separate cores that run at 2.8GHz and each core has its own 512KB of Level 2 cache memory; there is a 6MB Level 3 cache memory that all the cores can access. The CPU also has a built-in dual-channel memory controller that supports DDR2 and DDR3 memory. If you're an existing AMD user, you can look to the Phenom II X6 1055T as an avenue for upgrading, as long as you have a motherboard with an AM2+ CPU socket and an AMD 760 chipset or higher (but as always make sure you check the vendor's Web site first to make sure). You may need to perform a BIOS upgrade though. For a new system, it's best to look for a motherboard with an AM3 socket and an AMD 890 chipset. We tested the Phenom II X6 1055T with a Gigabyte GA-890GPA-UD3H motherboard, which features an AMD 890GX chipset with integrated ATI Radeon 4290 graphics; the CPU was recognised by the BIOS and Windows 7 without any problems. Its performance in everyday office applications, image editing and media playback is swift, but if you get this CPU only to run Microsoft Office and Firefox, then you'll waste its potential. The six cores will really come into their own when you run many programs at once, and also when run high-end tasks such as media encoding and rendering. If you use multi-threaded applications, then all the CPU cores can be dedicated to running those applications and cut down on the time they take to complete their tasks. If you run applications that can only make use of two CPU cores, the Phenom II X6 1055T's Turbo Core feature can slow down three of the cores to 800MHz, and boost the cores of the other three to 3.3GHz, thereby giving that application a little more speed to burn. This function is built into the CPU and happens automatically and instantaneously. Using Gordian Knot to encode a 3.5GB DVD file to a 1.5GB Xvid file took only 48min. All six cores were used to perform this task, but as the program didn't employ 100 per cent of each core, we were still able to comfortably use the system to perform other tasks in the foreground. Virtualisation is supported in the Phenom II X6 1055T and under Windows 7 we were able to run virtual sessions of Windows XP, Windows ME, Windows 98 and Windows 95. However, sometimes Windows 7 would give us an error message saying that our system did not have a CPU with support for virtual machines. In this instance we had to go into the BIOS and change the virtualisation setting from (from enabled to disabled) then reboot the machine. 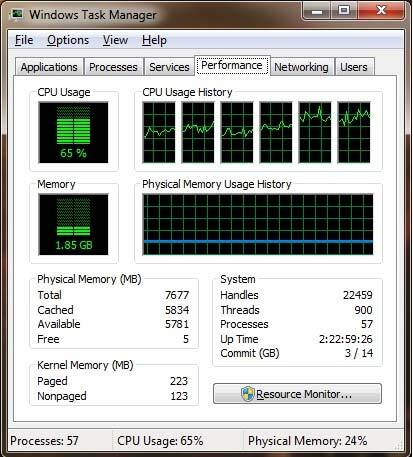 The particular state of the setting didn't appear to make a difference to Windows 7; we were able to run virtual machines even with the setting disabled. The Phenom II X6 1055T supports virtualisation. 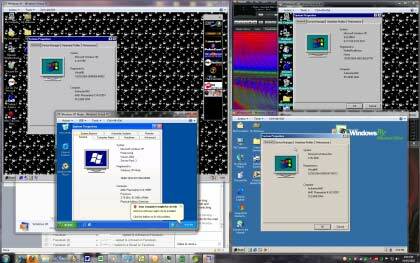 In this shot we're running Windows XP, ME, 98 and 95 under Windows 7 Professional. So you can see that despite being a relatively inexpensive CPU, it's capable of being used for high-end pursuits. We recommend it highly for anyone who wants to build a fast machine without spending too much money.